Hey Friends! Shelly from Vegetarian ‘Ventures here today to chat all things fall! Not sure what it’s like in your neck of the woods but we’ve had non-stop rain this past week to welcome in the new season. I’m not complaining though, as my two favorite activities are perfect rainy day past times: baking and listening to records. For me, there is nothing more therapeutic than putting on a favorite record and whipping up a warm and comforting baked good with raindrops dotting the windows in the background. I had the best time whipping up these festive muffins because the new Kurt Vile’s ‘B’lieve i’m goin down…’ album came out last week and it’s the perfect rainy day soundtrack (although if you prefer something more upbeat while baking then I’d recommend skipping Kurt this time around and putting on All Dog’s fuzzy new record ‘Kicking Every Day’ – another great fall release!). 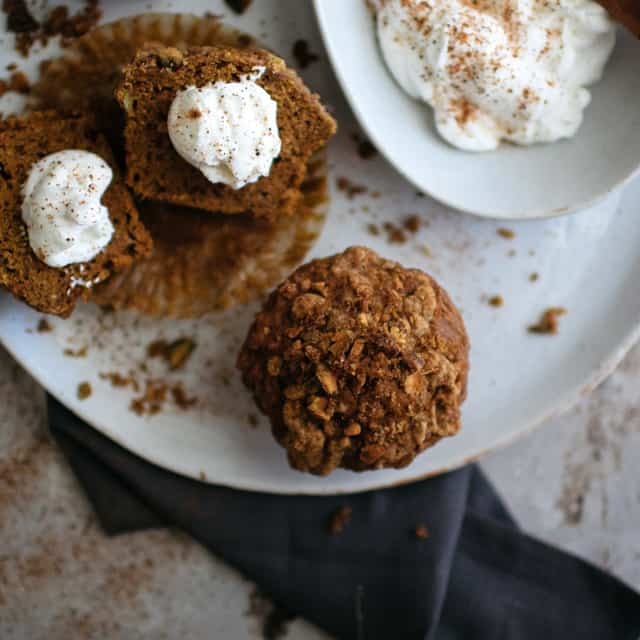 These muffins are quintessential fall. 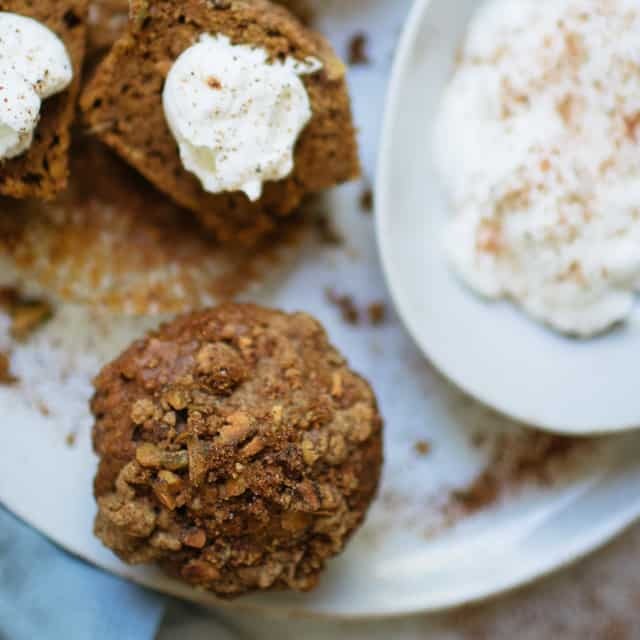 They are what you make when you can’t resist picking up that can of pumpkin from the fall display at the grocery store, just because you’re feeling festive. They are the perfect treat to feed your guests on a chilly morning with a warm cup of brew. 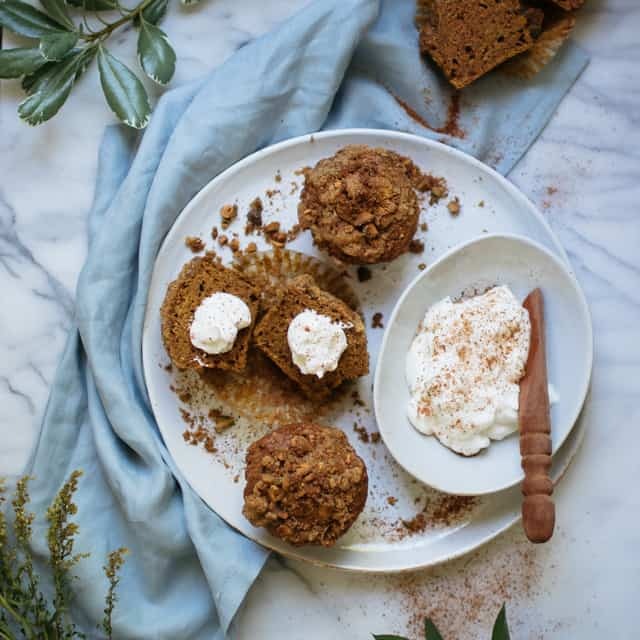 They are an easy snack to sneak into the apple orchard on your Saturday afternoon and a perfect dessert to indulge in after dinner. The pistachio crumble adds an extra crunch and decoration in the form of beautiful green speckles which dot the orange batter. 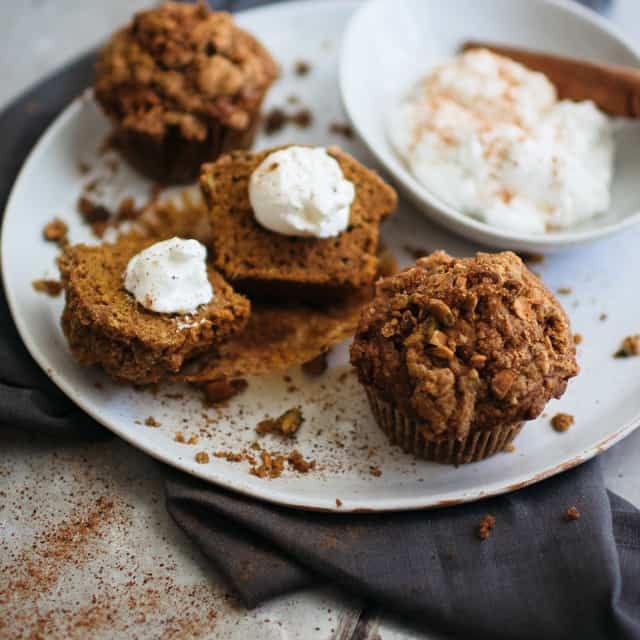 Don’t hesitate making these muffins because fall will be over before we know it! Preheat oven to 350 degrees and prepare a muffin tin by lining with muffin liners. In a mixing bowl, whisk together the flour, sugar, baking powder, baking soda, cinnamon, ginger, nutmeg, and salt. 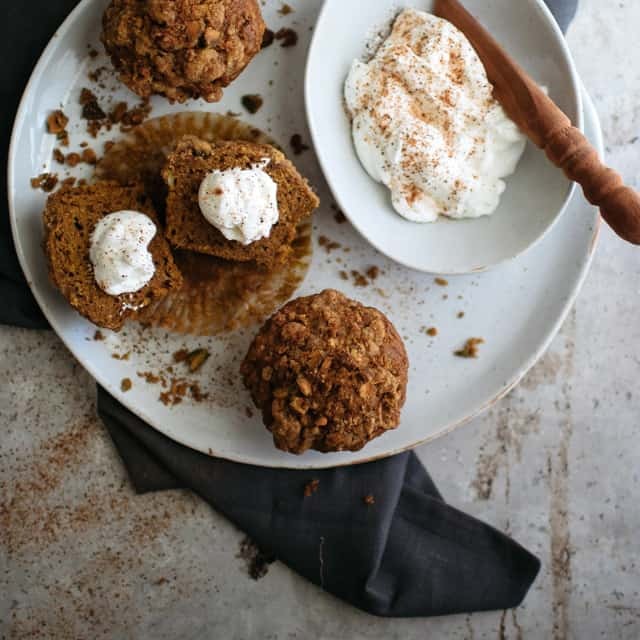 Make a well in the center of the dry ingredients and pour in the pumpkin, beaten eggs, coconut oil, and vanilla. Whisk together the wet ingredients in the center until blended and then use a spatula to fold the dry ingredients into the wet just until the dough is completely mixed. Finally, fold in the chopped pistachios. Spoon the batter into the muffin tin so that each muffin is ¾ full. For the crumble: Use your clean fingers or a fork to mash together the sugar, flour, pistachios, and butter until a thick crumb forms (it’s okay if there are a still a few butter chunks). Sprinkle each muffin by dividing the crumb evenly between the twelve muffins. Bakes for twenty minutes or until the top of the muffins have browned and a toothpick comes out of the center clean. 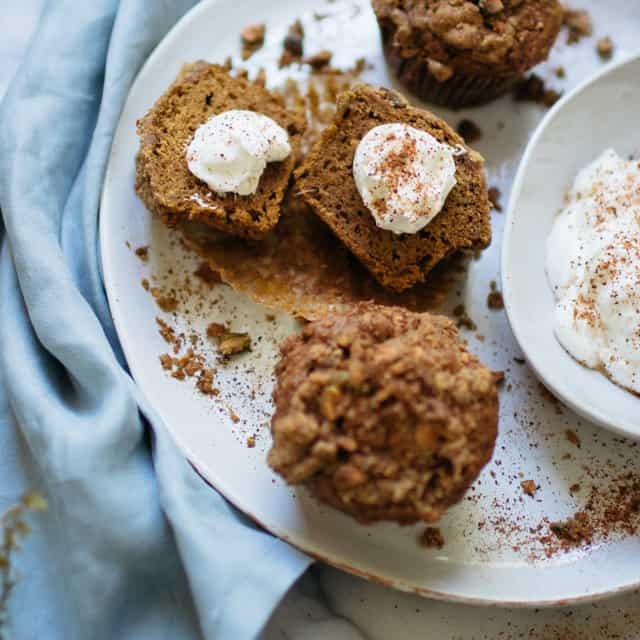 Let cool slightly and serve with cinnamon spiced yogurt or butter.